Secret Bought some at 0.31! Secret Let move up to 0.35! Secret Ammarnysa how much you bought? this counter got so many volume for this 2 days. Kimchi QR continue to maintain profitable with consistent good track record. I really wonder why volume so high recently and 1st time listed in top 20 active stock since two weeks ago, hope the second wave is coming soon. I always believe this counter is a hidden gem!!! ooi19 this counter how ? 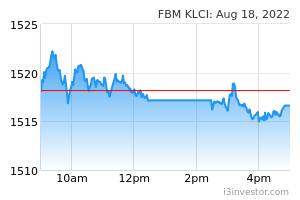 plan to buy some units for this ..
Kimchi Q result was outperforming? Should announce by tomorrow right? azta12 slow and steady before wings start to open. kingcobra dusts will settle down once internal conflicts over!!! Yusuf Isa Why drop so much? kingcobra biasa lah tak puas hati dgn major shareholers....jual saham lahh! azta12 v shape recovery in the prc is expected. as the water tariff review is otw. Yusuf Isa Not stable anymore. Down another 1 cent. koi koh load some ? kingcobra forget about this counter....now keeping in deep freezer!! B4b4 Btech is expanding in terms of property, plant and equipments. In 2016, it was RM 24m, 2017 was RM 38m and 2018 is RM 45m. Meaning the company is buying more non current assets for its expanding business. Its core business is water waste treatment in industrial companies. Note, buy sell at own risk. B4b4 A profit making stock, cash rich and giving out dividend consistently too. Last year gave out dividend to all shareholders worth RM 4.032m, ie 1.6 s per share. B4b4 Btech chart has always been V sharp recovery if you looked into the past.